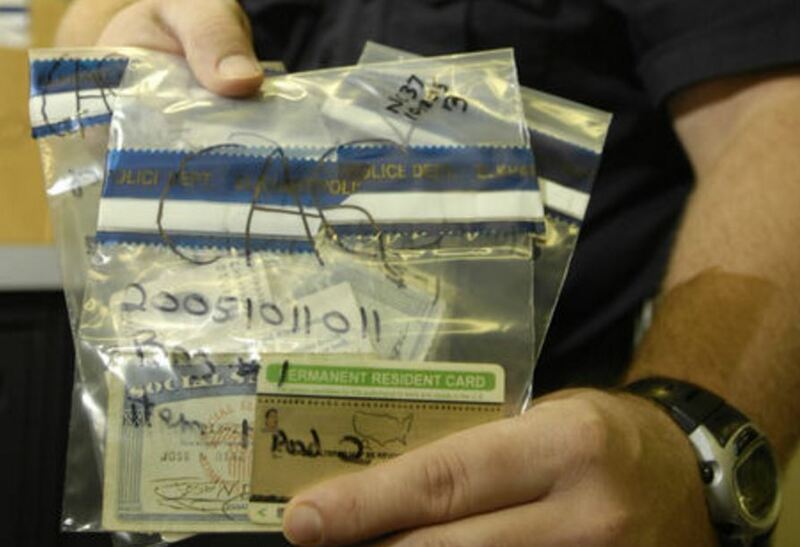 In this archive Elkhart Truth photo, an Elkhart police officer holds false identity cards confiscated by the department. Stealing IDs takes a toll. I wrote late last month (look at this blog entry) about an undocumented immigrant arrested for identity theft, Candida Rosete. She was brought here as a child by her parents, and she defended her place here, saying the United States is her country, even if she doesn’t have papers to be here. It was in the context of a spate of arrests by the Elkhart County Sheriff’s Department of people who used fake IDs to get work and calls for tips about other suspected undocumented immigrants. The sheriff’s department actions generated a lot of criticism from immigrant advocates. Last week I went for the other side of things and spoke to a man, Joshua Buelna, whose identity had been stolen by an undocumented immigrant. Life has been terrible for him, and he ultimately had to file bankruptcy because of all the debt incurred illegally in his name. Others used his Social Security number to rent homes, get cars, acquire mobile phone contracts and more and he was left to deal with the fallout after they skipped out on the bills.